After the first prostration, the Prophet ﷺ would raise his head, lay his left foot along the ground and sit on it relaxed (Ahmad). 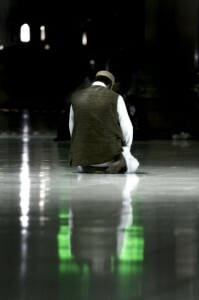 In each cycle of prayer, we go into rukoo’ (bowing) once, and into sujood (prostration) twice. Have we ever wondered why? Ibn Al-Qayyim has stated that because the sujood is the most important pillar in the prayer, its significance is shown in its repetition. 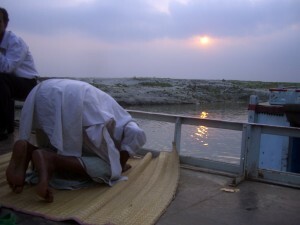 We desire to taste that sweetness of being the closest we can be to Allah, and thus fall into prostration again. May Allah enable us to taste the significance of every single action of prayer. Ameen. How Does One Pray When Dealing with Health Issues? Once again, Jazak’Allahu Khairan Sr. Jinan for your efforts. I look forward to each and every post in this Series. 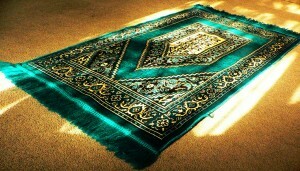 As I said before, it is really enhancing my salah with each new lesson. I had actually learned the prayer “Rabbi -ighfir-ly” from a YouTube series “Learning to Pray as the Prophet Did” or something similar to that, yet I was really happy to learn more details regarding this part of salah from part of the series. Just one question – how many parts will there be in total? At the end, I would love to print them out so I can refer to them when needed. Thanks in advance. JazakAllah khair for your comments. There are 28 parts to the series. Please remember us all in your du’as. I am under the impression that عافني means “grant me health,” while اعفو عني means “pardon me from sins.” Of course these have always confused me so I seek your expertise, ya mu’allim. وفي حديث أَبي بكر، رضي الله عنه: سَلُوا اللهَ العَفْو والعافية والمُعافاة، فأَما العَفْوُ فهو ما وصفْناه من مَحْو الله تعالى ذُنوبَ عبده عنه، وأَما العافية فهو أَن يُعافيَهُ الله تعالى من سُقْمٍ أَو بَلِيَّةٍ وهي الصِّحَّةُ ضدُّ المَرَض. يقال: عافاهُ الله وأَعْفاه أَي وهَب له العافية من العِلَل والبَلايا. وأَما المُعافاةُ فأَنْ يُعافِيَكَ اللهُ من الناس ويُعافِيَهم منكَ أَي يُغْنيك عنهم ويغنيهم عنك ويصرف أَذاهم عنك وأَذاك عنهم، وقيل: هي مُفاعَلَة من العفوِ، وهو أَن يَعْفُوَ عن الناس ويَعْفُوا هُمْ عنه.